Most of the time when it comes to the bride and groom portrait time of the day I try and keep the posing pretty simple. That’s were this stunning couple comes in. Right after their wedding ceremony we photographed some family formal portraits and bridal party photos. Once everyone walked back to the reception site I started in on their portraits. It really puts the couple at ease when there is no one else around expect for them and the photographer. I simply tried and put them in the best possible light to get some photos of Lake Tahoe in the background. I had them hold hands and look at me for some of the pictures. After that I just have them look at each other and smile. Then that’s were I come in, I’m usually rambling on saying stupid stuff and trying to engage them. This is when the magic happens and usually they join in with me and say something funny and the laughter starts to happen. Then I proceed to take photos as quick as I possibly can to capture images like this one, were the couple is having a fun light hearted moment together on their wedding day. This technique works most of the time and you can capture some great photos that shows their true personality. 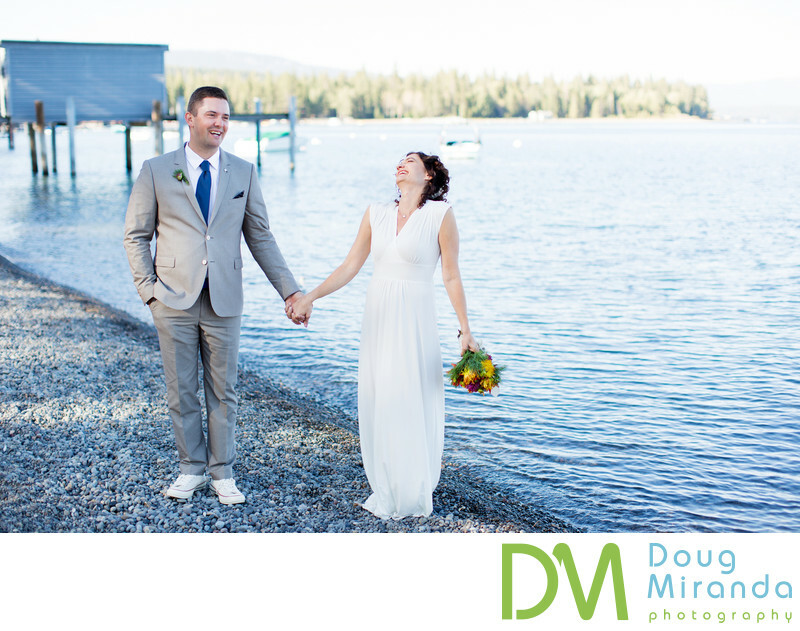 This couple was married on the west shore of Lake Tahoe at the bride’s gramps’s cabin which is located just across the street for the waters edge. It was a nice fall day with no one else around on the lake shore that late afternoon. After a couple more minutes of picture taking we all walked back across the street to a warm welcome from all their guest at the reception. They enjoyed the rest of the night eating, drinking, dancing and most of all having fun. Location: West Lake Tahoe, CA. Keywords: West Lake Tahoe (9).